This speaks not only to packaging’s power, but also to its versatility. Packaging is both a utility and a communications tool wrapped into one, adding to the experience your customer is paying for and communicating your brand values and identity at the same time. This is a large part of the reason keeping up with the latest trends in packaging is so important; it guarantees that you always remain on the cutting edge of such a mission-critical element of your overall enterprise. 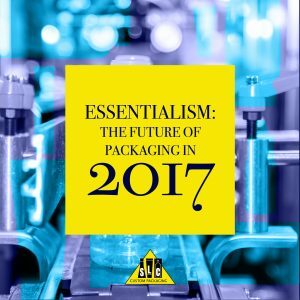 In terms of the top packaging trends for 2017, essentialism is leading the way as the one to watch. What Is Essentialism in Packaging? This is great, but it is also something of a Catch-22 as it becomes harder to wade through the information you have to find what you’re really looking for. Essentialism is a trend that addresses this problem for everyone’s benefit. It allows you to cut through the noise and focus on what really matters. This doesn’t just speak to what information you choose to put on the packaging, but the experience of interacting with that packaging itself. From the graphic design to how easy it is to open to whether or not it can be used again, essentialism is about keeping packaging as simple as possible for everyone involved. It’s not minimalism in packaging — it’s something even better. The reason essentialism in packaging is so powerful is clear: It’s about boiling things down to the bare essentials to help the customer make the most informed decision possible. What it’s NOT about is hitting your customers with every single feature, benefit, or innovation your product has to offer — they don’t have time for that. Again, we live in a fast-paced world. You’re not only competing with other products, but you’re competing with the Internet. You’re competing with social media. You’re competing with friends and family members. People need to make a decision, and they need to make it fast. Essentialism is by far one of the best ways to help YOU help THEM accomplish that. A very clean-cut, visual product information can convey all the information you need AND make a product truly shine by using the properties of simplicity to your advantage. This doesn’t mean that you should eliminate all copy and rely on only visuals. A healthy blend of both is still recommended. However, it’s about doing more with less. It’s about taking a message that you convey in 10 words and trying to figure out a way to say the same thing even more effectively in just five. It’s about boiling everything down to its purest form, presenting your customer with just what they need and not a bit more. Essentialism is also a terrific way to make a strong statement. If you go too heavy on information overload with your packaging, it could give off the impression that you’re trying to CONVINCE someone that your product is as great as you think it is. In the end, you know it’s not about that at all. You’re trying to TELL them that, objectively, your product is the one they’ve been looking for. By grabbing onto the properties of essentialism and leveraging them to your advantage, what you’re basically doing is letting your product speak for itself. Again: Essentialism and simplicity are not quite the same thing, though they do share a lot of the same ideas when it comes to packaging. It’s not about quantity, it’s about quality. It’s about finding the purest, most-effective way to get your message across with your packaging in a way that will ultimately benefit your customer, your product and your brand. These are the types of benefits you truly cannot put a price on. At SLC Custom Packaging, we believe that staying ahead of all the latest trends in packaging is important — after all, the packaging itself is mission-critical to your organization’s success. Remember that the decisions you make in this area don’t just inform how a customer experiences your brand, your visual identity and your core values — studies have also shown that about 52 percent of customers say they would likely return to a particular business specifically because their product came in premium packaging in the first place. Fully 90 percent said they’d be likely to share that with others. To find out more about upcoming packaging trends for 2017 and beyond, or to learn about how we proudly act as your single source for all of your quality contract filling and custom packaging needs, please don’t delay — contact SLC Custom Packaging today.